This year will be 25th year of the RHS Hampton Court Palace Flower Show. The show was first held in 1990 and created by Historic Royal Palaces and Network Southeast. In 1992 Network Southeast announced that it was withdrawing its subsidy, and the RHS was the successful bidder to take the show over. The first RHS Hampton Court Palace Flower Show was held in 1993. Although it lacks the history of the Chelsea Flower Show, the RHS Hampton Court Palace Flower Show has a Royal setting and in a relatively short time has established itself as one of the world’s largest flower shows. Each year the show has particular themes and this year they are Grow, Feast and Inspire. In Grow, keen gardeners have access to a range of nursery displays and plant stalls, with RHS advisors on hand to offer expert tips to take back to their own gardens. Flower Boxes displaying different growing styles and schemes to inspire every gardener. In Feast, visitors can find out how to grow their favourite vegetables, taste a wealth of fine foods and take away growing ideas to try at home. The entertaining Feast Cookery Theatre. 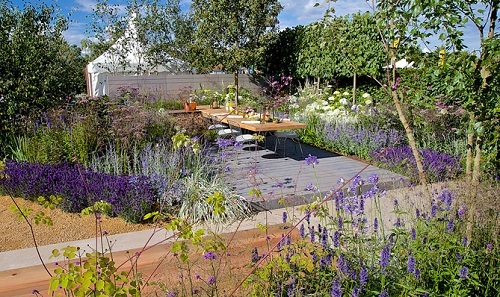 Inspire encourages visitors to re-think their preconceptions of contemporary garden design, with horticultural creations pushing boundaries and championing innovation. The popular Conceptual Gardens will be on the theme of ‘sensations’ – this will get designers thinking. New this year, is a wildcard option available for exceptional designs that are ‘off-theme’. Tradestands – new sheds, pots, irrigation systems and more. Tickets are available for Thursday to Sunday for the General Public. Hampton Court and Kingston stations are approximately 30 minutes from London Waterloo, with frequent trains. The showground is a 15 minute walk or short ferry ride (£2.50 for a single journey) from Hampton Court station, or a 30 minute cruise from Kingston station (£6 single, £7.50 return).